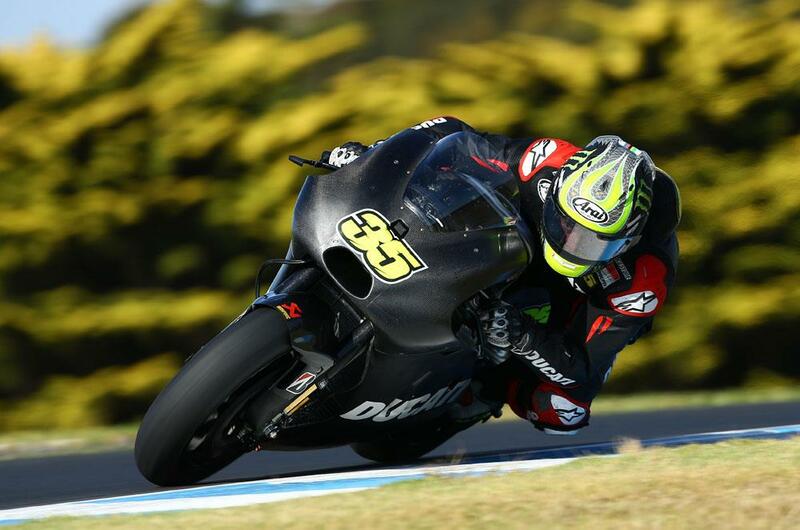 British rider Cal Crutchlow was left baffled by a front tyre issue that forced him to abort a planned full race simulation on the final day of Bridgestone’s crucial tyre test at the Phillip Island track in Australia. Crutchlow was scheduled to do a full distance run of 27 laps in cool and windy conditions on the final afternoon, but he had to scrap the simulation after 18 laps because of a front tyre problem. Crutchlow, who set a best time of 1.29.576 on the opening day, was at a loss to explain what had gone wrong with the front tyre. It was ironic that the 28-year-old suffered a front tyre issue during a test where solving chronic rear tyre issues from last year’s Australian Grand Prix was the main priority. The three-day test was arranged by Bridgestone and Moto2 supplier Dunlop to try and find a solution to the excessive tyre wear problems that were caused by an abrasive new track surface at last October’s race. Crutchlow told MCN he had started to experience the front tyre issue after 15 laps and the sudden loss in performance saw him stay out for another three laps before he pulled in. Crutchlow, who rode a GP14 Ducati in full Open class trim including the Dorna-supplied Magneti Marelli hardware and software this week, said: “I had to abort the race simulation after 18 laps with a destroyed front tyre and that’s ironic. We had to test rear tyres and the front tyre got destroyed. I was quite disappointed about that because I was ready to do 27-laps and felt good on the bike and my consistency was there. We chose the wrong rear tyre to do the simulation on and it was the first time I’d left the pits on that spec. I decided to carry on and I should have chosen the other rear. After 10 laps I was noticing I should have used the other one but we are here for to give Bridgestone information.